“The most persecuted group in the world”: Will the minority Muslim Rohingya reap the benefits of Myanmar’s open election? Myanmar is on the cusp of a profoundly historic change. After decades as dissidents against a succession of military regimes and their supposedly civilian political wing, the Union Solidarity Development Party (USDP), Aung San Suu Kyi and her National League for Democracy (NLD) party are set to win an overwhelming proportion of the contested seats in parliament. With the votes that have been counted so far, the NLD is hovering at around 90 percent support. This has been Myanmar’s first open election since 1990. The NLD won categorically that contest as well, but the result was annulled by the ruling military junta and Suu Kyi has spent many subsequent years under house arrest. This time, however, things feel different. Since 2008, the military establishment has moved toward greater engagement with and opening toward the rest of the world, and it won many trade deals from neighboring China and India, as well as the West, with the promise of a sustained transition toward democracy. Even the USDP president Thein Sein has publicly congratulated Suu Kyi and the NLD on their success in the polls. But if we in the West still harbor any illusions that such transitions can only have one natural and inevitable outcome, if we suppose that democracy is really the point of political equilibrium and that everything must eventually tend towards a fair democratic establishment, and if we suppose that this necessarily means that the lives of the people of Myanmar will automatically get better as soon as this happens, then we need to think again. For one thing, 25 percent of the seats in the Myanmar parliament are reserved for the military. The military junta that has ruled this country for much of its history since independence from Britain will remain very much at the heart of the political process for the foreseeable future. This has been widely reported. 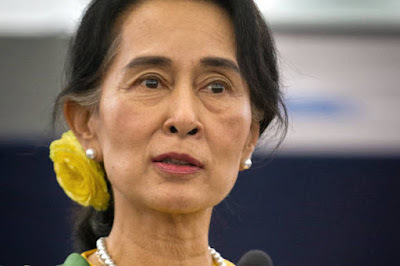 It has also been noted that the military and the USDP are expecting to meet with Suu Kyi to negotiate on the transition arrangements once all the votes have been counted. Though it has not been noted that this is not something that happens in democratic countries. In democratic countries there is a handover of power, not a negotiation on the conditions under which the elected representatives of the people may be allowed to exercise some executive offices. What hasn’t been reported is that the military now has a virtual economic monopoly on all the country’s economic resources and key industries. For all practical intents and purposes, a small and concentrated number of generals are lords of all they survey, very much like feudal lords, as far as the economy of the country is concerned. The wider engagement with the international community and the trade deals that are expected to flow out of this will not weaken the military’s power base. It will do the exact opposite. And if the NLD challenges this too strongly, it can expect to see itself unceremoniously deposed, just like last time. But the issue that concerns me the most is the situation of the Rohingya community in Myanmar. They are the largest and most visible Muslim community in the country, at around 1.3 million people from a total population in the country of 51.5 million. They have been progressively marginalized and excluded from society by a succession of regimes, civilian and military, ever since independence in 1948. As a result, as many as half of the total Rohingya in the world today are refugees in neighboring countries, in camps in Bangladesh, Malaysia, India, or captured as slaves in the Thai slave trade. This year’s South East Asian migration crisis was predominantly the movement of the Rohingya trying to escape from Myanmar, where, since 2012, they have been under recurring physical attack from neighbouring Buddhist extremist groups in the country, and to some extent, from various factions and groups within Myanmar’s police, border security and military agencies. Tens of thousands have been killed in so-called communal violence. There are currently well over 100,000 in refugee camps within Myanmar. The authorities maintain that these are the only places where they can keep the Rohingya safe, but here they have very limited access to work, education or health services. Needless to say, they were not allowed to vote in these elections. In fact, they have been largely excluded from the right of citizenship in the country for decades. And we shouldn’t assume that the lives of the Rohingya are about to get better if Nobel Peace Prize winner Aung San Suu Kyi does come to power in Myanmar. She has not been at all keen to stand up for the Rohingya, ever. Like the military regime, and like the Buddhist extremists who perpetrate the attacks on the Rohingya, she refuses to acknowledge the people’s existence as an ethnic group – instead, she, like the others, regard the Rohingya as Bengali immigrants who “should be returned to Bangladesh.” Despite the fact that even according to them they have lived in the country for generations. And public popular opinion in Myanmar among the Buddhist majority of 80 percent largely concurs. According to the U.N., the Rohingya is at the moment. And many expert observers now agree that what is happening to them can be described as a slow-motion genocide. There is no reason to suppose that Suu Kyi and the NLD will do anything to reverse this of their own accord. Quite the contrary: Some of their political power base and closest allies are the very Buddhist extremists that are at the forefront of the persecution. The international community must be more vigilant and more decisive than ever, and must intervene to pressure Suu Kyi and the new democratically elected leadership of the country to extend the fruits of democracy to all people of Myanmar, and especially the most vulnerable: the Rohingya. Dr. Azeem Ibrahim is a RAI Fellow at Mansfield College Oxford University and author of the forthcoming “Rohingya: Inside Myanmar’s Hidden Genocide” to be published by Oxford University Press in March 2016.